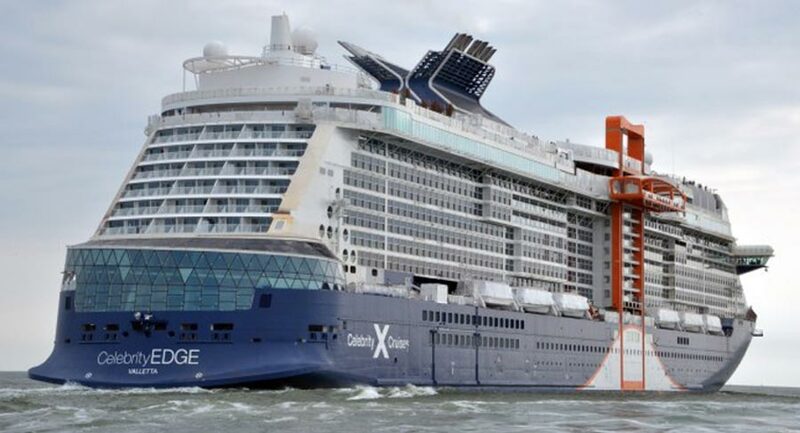 Celebrity Edge which is a new generation cruise ship for Celebrity Cruises has successfully completed her sea trials today, a major milestone before the ship construction is completed. One of the most anticipated new cruise ships of 2018 has completed sea trials today at the Chantiers de l’Atlantique shipyard in France. The shipyard which is formerly known as STX France has been a hive of activity has the new class ship for Celebrity Cruises reaches a major milestone. During sea trials, 60 tests are being done to make sure she is seaworthy and able to sail for delivery to the cruise line. 470 workers are onboard the ship during the trials at sea. Maneuverability and propulsion systems are usually put through tests and aspects of the vessel which can only be operated at sea. As expected the coverage of the Celebrity Edge sea trials were popular as it’s a good chance to how she looks and how far she is to completion. The ship which will bring new innovations to the industry first departed on her sea trials on the evening of July 26. the ship left the outfitting dock and headed towards the Joubert dock where the sea trials then began. Celebrity Edge will now continue her fitting out phase at the French yard. The ship will be delivered in November 2018 marking a new era for the cruise line with new features and the first of fours Edge class ships. Cruise Hive readers can find out more about Celebrity Edge features here. Once complete she will be 117,000 gross tons and have a guest capacity of 2,900.